When it comes to career, you often get panicked and think about what you should do. With such fear of failure, you may get totally messed up. Sometimes, it also even gets harder to choose whether to follow passion or academics. Whether by following passion will help them earn enough money. Therefore, there is a hell lot of confusion among students about what can be the exact ‘right’ option for them. That is why; here are some of the best career advice that can help you to choose the right profession. If you can implement these advices while choosing the career, you can reach the zenith of success. Here are some of the best tips. Use your skills:- It may happen that the first job that you do may not be the one you want to. It may also happen that it is also not related to your academics. However, whatever the job is, you need to show the proper skills and talent that you possess. Do not take any job for granted. Take every job as an opportunity:- It is always good to explore the career prospects and find out which genre can suit you the best. So, when you start working anywhere try to learn every little thing. If you do that, you can open many paths and then choose the right career option for you. Do not pressure yourself: – If you are in a hurry to choose the right career option, then it may happen that you end up in a mess. So, it is always better not to choose any job in a hurry. If it is about financial issue, you can take jobs as per requirement, but give it a thought that whether you want to pursue it as your career or not. Be ready for any consequences: – You need to understand that job and career are very much vulnerable and here everything cannot go smooth. 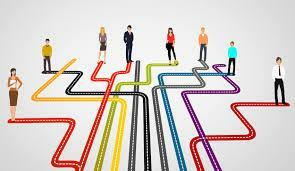 Thus, when you join for a job by choosing it as your career, you need to understand that anytime anything can happen. So, be prepared for the same. Do not let any ups and downs of your career or professional life, affect your mental peace. Advance your career every 2 years: – If you get into a corporate job, you need to know that every single day; you can get new opportunities for enhancing your career with proper hike and designation. You have to take chance in every aspect of your career. Improve your knowledge: – You need to know that for a proper growth in the professional field too, you have to learn new things and make yourself more eligible. In this competitive world, it is very much important to upgrade yourself so that no one can beat you. Therefore, read, learn and implement the knowledge to make yourself more skilled. Try to accept criticism: – For an excellent growth in your professional career, you need to bring certain things within yourself. The most important one among those is flexible to take criticism. You need to understand that you can make mistakes and people are there to give you negative feedback. So, at that time, do not think it as negative and try to work on your mistakes. Try to be accustomed with changes: – In your professional career, there can be many things which are out of your expectation. But, when you get into the working process, you have to be accustomed with different changes that come up. Work harder and overcome challenges:- The mantra of being successful in your career is to find out that how hard working you are. Not only that, along with your hard work, you should also be able to overcome challenges and cross every hurdle that comes up. Consider big opportunities carefully:- When you get an outstanding career opportunity, it is obvious that you will very happy and want to grab the same as fast as possible. However, you need to know that every single opportunity should be judged before taking the leap. If you do not check every single factor properly, then in the long run it can be big trouble. Have control on your behaviour:- It may happen that many things do not go as you had expected. But, it is important that in those times you have a good control over your behaviour. Otherwise, misconduct or a loss of temper can cause a lot of consequences. Patience is the key:- In any working sector, you need to keep patience to excel in the same. If you lose patience and hurry about every little things, it can affect your career growth as well. Be honest in every aspect:- There can be situations where you can get opportunity of getting bribed or do something which is against your work ethics. Even if you see a good way of making money with such shortcuts in career, always remember it is not only unethical but also dangerous. Thus, do not loose honestly at any cost. Build up a strong network:- If you build a good network with your colleagues, then it can be helpful for you to get new opportunities. So, open up as much as you can. So, for uplifting your career to a different level, these are some of the helpful advice that you should have. Once you get used to it, you can reach to the peak of success easily. Author Bio:-Natalie Graciais associated with Top homework helperfor 5 years and she is also one of the reputed professors of English in University of Melbourne. She provides essay help service to lot of students. She is recommended by most of the students for an English assignment.